World-wide interest in the Seven Commandments for the Children of Noah (in Hebrew, the Sheva Mitzvot Bnei Noach) has grown exponentially over the last few decades, and a great number of Gentiles have already committed themselves to their Torah-prescribed observance. Until now, however, a clear guide for the practical application and observance of these precepts has been lacking. Sheva Mitzvot HaShem (“Seven Divine Commandments”) is the result of an historic project launched by Ask Noah International in 2005. Expertly compiled in Hebrew by Rabbi Moshe Weiner of Jerusalem and reviewed by prominent Torah scholars, this multi-volume set examines the halachic details and foundations of the Seven Noahide Commandments. 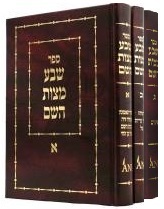 The volumes are written in the style and format of the classic Shulchan Aruch (the Code of Jewish Law) by Rabbi Yosef Caro (1488-1575 C.E.). Rabbi Weiner’s work successfully brings an important but neglected area of Torah to the forefront of rabbinic attention. Volume I (396 pages) focuses on the Noahide commandments between man and G-d, and includes many chapters on the fundamentals of the Noahide faith, the prohibitions of idolatry and blasphemy, and the dietary prohibitions associated with causing unnecessary pain to living creatures. It also includes a scholarly preface by Rabbi Weiner which explains the halachic (Torah-Law) basis of Jewish outreach to Gentiles for Torah-based learning and observance of the Seven Noahide Commandments. Volume II (396 pages) focuses on the Noahide commandments between man and his fellow man, and includes many chapters on the Noahide prohibitions of murder and harming, forbidden relations (including the topics of marriage and divorce), and theft. The new Volume III (224 pages) focuses on the Noahide commandment between man and his fellow man that involves the establishment and administration of righteous Laws and Courts. It also includes an Appendix on the Torah Laws relating to a Ger Toshav – a Gentile resident citizen of the Holy Land of Israel, in the times of the First Holy Temple and in the future Messianic Era. Sample customer review: “You sent me Volume 1 of Rabbi Moshe Weiner’s Sheva Mitzvot HaShem. I am just about done with it (20 pages left), and wanted to write and tell you how impressive a work it is. I found the breadth of learning impressive, and much thought and ameilut [labor] was put into it.” – Rabbi G. R.